Won't You Be My Nabor: Graduate, Celebrate, Mom is Great!! Graduate, Celebrate, Mom is Great!! This weekend (and past week) has been absolutely crazy!!! 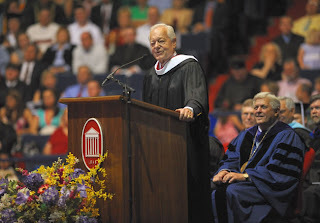 Saturday was Ole Miss graduation, which I took part in. I am taking 2 classes this summer to finish up, but since I am practically done and since there is only one graduation ceremony a year, I did it! My parents have been talking about and looking forward to it for so long, so I knew not only did I have to do it for myself, but for them too! I had my last final Thursday, worked Friday, stayed up SO late (till 3am) Friday night/Sat. morning getting things ready for the big day and for my graduation party Sat night. We had to get up at 6am Sat. - so I only got about 3 hours of sleep, my fam didn't get much more either. The ceremony started at 9:00am, but I had to be there at 8:30. Oxford is about an hour away from where we live, so we had to get up quite early, get ready and drive in the rain. I took a big cup of coffee with me, I needed some major caffeine! Since it had stormed so bad the night before and early that morning, the first part of the ceremony was moved inside. 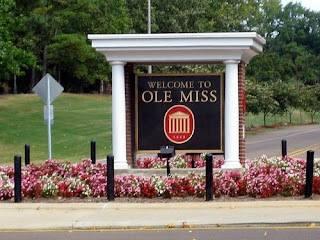 I was a little disappointed since it was supposed to be in the Grove - but oh well. The speaker for graduation was Bob Schieffer, chief Washington correspondent for CBS News and host of the network's "Face the Nation." He was also on campus this past September to cover the first presidential debate between McCain and Obama. His speech was very good and quite inspirational. My parents were there of course, along with my younger brother and Grandparents. Mike's parents also came, which was sweet! As soon as the ceremony was over, there were people all around telling us to go ahead and turn in our gowns, so I did. My parents were really disappointed because they wanted to get more pictures of me in my gown - so kinda felt bad about that, but oh well. We went to eat at the Boiling Point, then came back and rushed like mad to get ready for my graduation party. I had a hair appointment that afternoon, just to get my hair styled and fixed for the night - but since graduation had run late, it had put everything for the day behind, so had to cancel it. I wasn't too happy about that, but what can you do? The party was quite nice. It was at one of my favorite restaurants: Elfo's. We had a little private room that I love! The pics don't do the building justice - I love the red decor. We added our own little touches that matched the invitation for the party: zebra and red. And of course fresh flowers and candles, 2 of my most favorite things!! It was a night filled with good food, good drinks, and even better family and friends! It was a nice little party, although there were quite a few of my friends who could not be there. It was a busy weekend for many due to Mother's Day and all - if it had been another weekend, I know they would have been there. But it was wonderful just the way it was! My Mom made the sweetest little speech and read 5 quotes, 4 from celebrities (John Quincy Adams, Elvis, Judy Garland, the last one I am drawing a blank on at the moment . . OH NO . .) and then the 5th and final quote was from my Mom. It was the sweetest thing ever. She went on to say how proud she and my dad were of me and how she was so proud that I have always been my own person and not like everyone else - which is true. After she was done, everyone started clapping - it was the BEST part of the night! The next day was Mother's Day of course and we were all exhausted and decided to sleep in and get some rest (in other words we were bad and skipped church.) My dad flew in Thurs. night and was staying till Monday, so we wanted to spend the day with him too. Mike had to work, so it was just me, my brother and my parents. When we all finally got up, we had coffee, ate the yummy petit fours from my party for breakfast and then watched the sweetest movie "Broken Bridges" on CMT. It has Kelly Preston and Toby Ketih - if you have not seen it, I suggest you watch it - it is SOOO good. We have been wanting my dad to see it for a while, and he loved it!! So we spent the day lounging around in our PJ's. It was a great weekend! I was a little "blah" today. After anticipating something like graduation, and it being over, along with my Dad flying back to TX today made me feel kinda blah. I also felt so grateful to my parents for putting me through school all of these years and then for the party they threw for me! They have done SO much for me and wish I could repay them. But I know I already have because they said that the best gift I could ever give them, is graduating from college and seeing me walk across that stage, and I did that! I did!!! Congrats Lindsey! I know your parents must be so proud of you! Glad you had such a wonderful weekend!!! Thanks girls!! It's been a long time coming!! LOL!